New Delhi: As the ruling BJP trying to raise the tempo one nation-one election, the Congress on Tuesday said the slogan is just a gimmick to divert attention of people from the BJP-led government’s failures. The party also dared Prime Minister Narendra Modi to dissolve the Parliament early and announce parliamentary polls along with assembly elections of four states due in December this year. A party delegation also met the Election Commission of India regarding irregularities in the voters list in Rajasthan. Addressing a press conference after meeting the ECI, party general secretary Ashok Gehlot reiterated the party’s stand that simultaneous election of parliament and assemblies are not possible under the present constitution. He described the ‘one nation, one election’ slogan as a “gimmick to deflect attention of public from the present government’s failures”. 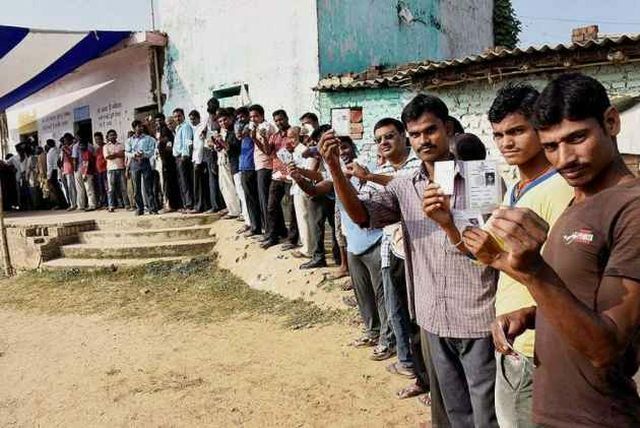 However, the former Rajasthan chief minister Ghelot, who was accompanied by other party leaders, said the only one way of holding simultaneous elections is to dissolve the Lok Sabha and hold polls along with Rajasthan, Chhattisgarh, Madhya Pradesh and Mizoram assembly polls. He underlined the fact that postponing the assembly elections in Rajasthan, Chhattisgarh, Madhya Pradesh and Mizoram and conducting these with general elections a polls in 2019 is also “not possible” under the Constitution or the law. He said it will be in the “best interest of the country to dissolve the Lok Sabha early, given the all-pervasive atmosphere of fear, intolerance and intimidation”. “The Congress will not only welcome an early Lok Sabha election, we are all geared to fight the BJP and eliminate it,” he said. The Congress leader alleged that the BJP’s intentions behind the ‘one nation, one election’ debate were not clean. “Their approach from day one has been wrong. If they were serious, they would have called all political parties for a meeting, discussed ways and means of implementing a proposal and debated solutions for cases where the Lok Sabha or state assemblies are dissolved before their term. But the government did not do any such thing,” he said. He pointed out that the BJP was floating this idea because it fears the losing of upcoming state elections, in which case it will be in a very weak state to face the electorate in 2019 Lok Sabha elections. Congress’s comments assumes significance as BJP president Amit Shah once again tried to make pitch for holding elections to 12 state assemblies including the present four along with 2019 Lok Sabha polls on Monday. Chief Election Commissioner also said the simultaneous elections are not feasible and possible under the constitution. Besides, ECI, almost all opposition parties also rejected the idea of ‘one nation, one election’ which is the part of RSS ideology. Even BJP’s ally in Bihar JD(U) also did not agree with the proposition. Ghelot, who led the delegation to the ECI, said the integrated draft electoral roll was published for Rajasthan by the CEO has many irregularities. The delegation submitted a memorandum to the Election Commission. It demanded to the ECI to intervene and ensure preparation of a sanitised final electoral roll in view of the inconsistencies highlighted in the report to ensure a free and fair election in the State of Rajasthan. A delegation was comprised of Avinash Pandey, Sachin Pilot, CP Joshi, Vivek Tankha and other leaders. Previous I-Day musing: Does not the law and its protection apply to all?